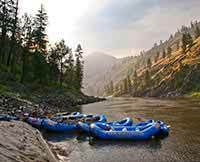 I had no idea what I was going to encounter on a whitewater rafting trip to the "River of No Return" in the largest road-less wilderness in North America when I set out with my son, to raft the Main Salmon River in Idaho. Our rafting experience could match no other. We met friends for a lifetime, have memories that we still talk about and can't wait to do it all over again! The weather was perfect for our July trip. The day time temperatures kept us in and out of the water (we did a lot of swimming AND rafting). The nights were perfect for sleeping out under the stars. We played games on some of the biggest sandy river beaches I had ever seen. We also had some superb meals all cooked from scratch! We all had more fun just trading out different rafts and watching each other conquer the rapids. We had oar boats (this is the way to go when you want to relax) and paddle boats (definite team building exercise) and inflatable kayaks (good thing I had my big, strong son in the front!). All in all, a river rafting adventure is the best way to leave your cares behind and disconnect from the pace and the worries of a busy schedule. 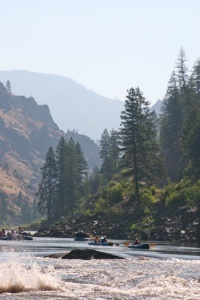 I loved my Main Salmon rafting adventure and will do it again!